Undoubtedly, you have read different horror stories about highways of death throughout the world. Some of them are a product of war or combat, while others are simply part of nature. 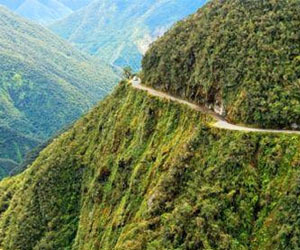 The Bolivian Highway of Death is located between La Paz and a city by the name of Coroico, in the Yungas region. It has an extension of merely 43 miles, but the path is extremely dangerous. In Spanish people refer to it as 'El Camino de la Muerte', which of course means Highway (or Road) of Death. Numerous Bolivians take this road every single day, and many others ride their bicycles just to feel the thrill of being close to dying. The Bolivian Highway of Death was built some time back in the 1930s by detainees during the Chaco War. It became an important route because there aren't too many roads that actually connect Yungas to the Amazon rainforest. The road starts out at La Paz and then passes through an area known as La Cumbre, which elevates to about 15,260 feet. The road is packed with abrupt slopes and it's extremely narrow; the width measures merely 10 feet, which is less than the width of two lanes. In addition, there are no guard rails whatsoever, and the visibility is always blurred because of the fog and the rain. The road can get very muddy when it rains nonstop, making it the epitome of a Highway of Death. Indeed, too many people have lost their lives on the Bolivian Highway of Death; yet, thousands of tourists – both local and international –swarm the road in search of a thrilling experience. Ironically enough, it has become sort of a local attraction to bikers, who visit La Paz just so they can ride their bicycle through the Highway of Death. In the 1990s, the road was covered by a TV show, which drew the attention of at least 25,000 tourists. In the last 12 years, at least 18 bike riders have perished on this road, and the average toll is between 100-250 deaths each year. The Bolivian Highway of Death has also been used for various commercials, including one for Mitsubishi's Outlander SUV. Moreover, the BBC covered this road in their sixth episode of Top Gear.